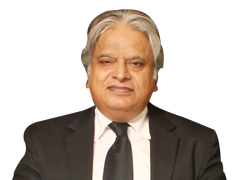 Mr. Meer, afounder member of the firm, is an advocate of Supreme Court of Pakistan and a senior partner in the firm. Mr. Meer, a gifted trial lawyer, after establishing himself in trial advocacy started focusing on corporate matters after doing his LL.M. in 1985 from the University of London (Kings College London). He is a renowned lawyer of the country and a well-recognized specialist of constitutional and commercial in Pakistan. Mr. Meer has also been involved in advising and/or drafting of several legal enactments in Pakistan. Being the senior partner, Mr. Meer supervises almost all wings of the firm. He personally handles important court cases in High Courts and Supreme Court of Pakistan and has scores of important court victories to his credit. Be it fundamental civil or criminal law or evolving corporate or IP law, people, at Meer & Hasan (M&H), have toiled day and night to provide quality legal services to its esteemed clients. Owing to strong grip on basics, a vivid vision of evolving legal concepts and concerted efforts of its associates in providing personalized service, M&H is one of the most reputed law firms in the country. Mr. Meer has acted as a member national legislative body (National Assembly of Pakistan), and also as Parliamentary Secretary to Federal Government for Law Justice and Human Rights. During this period, Mr. Meer had the opportunity to take active part in reviewing and discussing draft of laws in the Assembly. This experience has added new dimensions to his ability to understand as to how the administration views laws and has given him a clear advantage on his contemporary lawyers. Successfully pleaded the case challenging firing of hundreds of Public Prosecutors by Government of Punjab. Currently representing Pakistan’s largest telecom company in one of the biggest arbitration in Pakistan involving claims worth around 6 Billion Rupees. Represented a foreign based entity in completing a housing project consisting of more than 100 state of the art housing units in joint venture with Defence Housing Authority, Lahore. Advised and represented a known group in purchasing land worth 375 Million Rupees. Represented Sugar Dealer’s Association before Supreme Court of Pakistan in a public interest litigation. Office: 103-A Bridge Colony Lahore Cantt, Lahore, Pakistan.